This year's conference will be held at General Mills Inc.’s headquarters in Minneapolis. NAEM has secured a nearby hotel, DoubleTree by Hilton Minneapolis-Park Place. The hotel is only minutes away from the conference location. Book your travel early to take advantage of early bird savings. Minneapolis, nicknamed "City of Lakes" is the largest city in the state of Minnesota. Its name is attributed to the city's first schoolteacher, who combined mni, a Dakota Sioux word for water, and polis, the Greek word for city. The City of Minneapolis is committed to citywide economic opportunity and environmental health. Sustainability means balancing those concerns in the present without sacrificing future generations’ ability to meet their own needs. 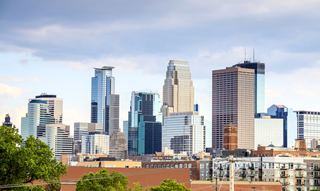 The City of Minneapolis prides itself in being a leader in developing efficient, sustainable practices and facilities, and provides resources for residents and businesses to take action to protect our environment now and for future generations. The closest airport to General Mills headquarters and the Doubletree Hotel is Minneapolis St.Paul International Airport (MSP). The airport is 18 miles away from the hotel and conference location. Taxi's from the Minneapolis St.Paul International Airport to the Doubletree Hotel will average $45.